In 326 BC, Alexander the Great, the Greek King famous for conquering an empire ranging from Asia into Africa and Europe, was making his way across Pakistan. 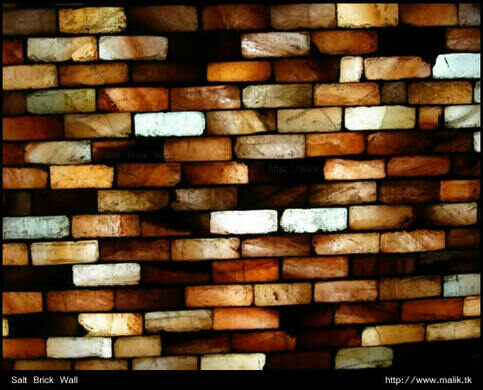 Stopping his army for a rest in the area now known as Khewra, Alexander’s horse began licking the stones on the ground. Seeing that all the horses were doing so and taking note, a soldier himself tried one and found that the rocks were quite salty. The Khewra salt deposits had been discovered. 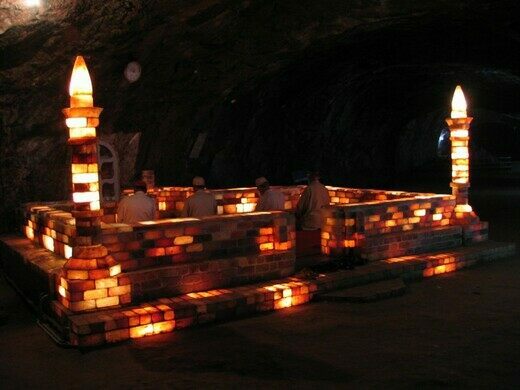 Today, some 2330 years later, the Khewra salt mines are the second largest in the world — behind the Sifto Canada, Inc., salt mine in Goderich, Ontario — turning out 325,000 tons of salt per year, and an estimated 220 million tons over its lifetime. 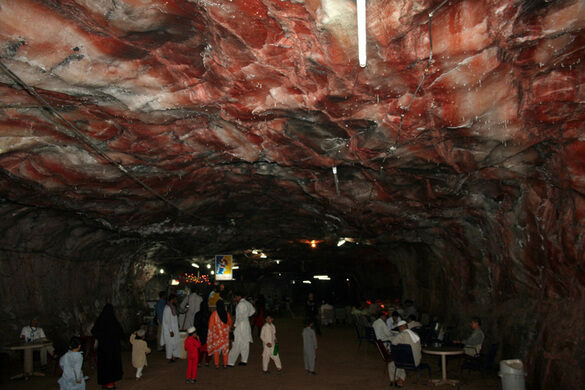 This is barely even a dent in the massive salt stores here, which are said to be 6.687 billion tons. 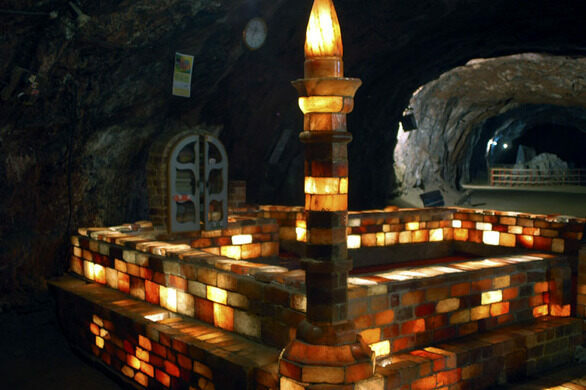 Officially, salt mining wasn’t recorded until the 1200s under the Janjua-Raja’ tribe, but salt has probably been mined and traded here since Alexander’s time. Covering an area of 110 sq. 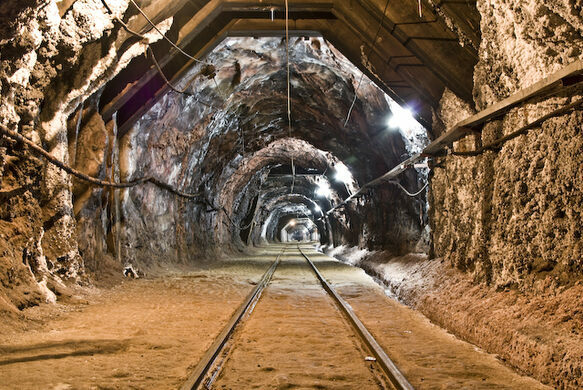 km, 228 meters or 748 feet deep (with 11 separate stories), the massive mine has over 40 kilometers of tunnels running some 730 meters, or nearly half a mile into the mountain under which the salt deposits are found. 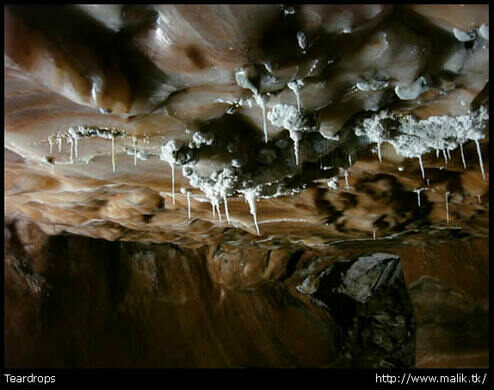 To keep the huge space from collapsing in on itself, only fifty percent of the salt found is mined; the other half serves as support columns to hold up the mine. With such a massive area, a large workforce, and the ease of carving and building with salt bricks, some interesting sights have been built within the salt mine. 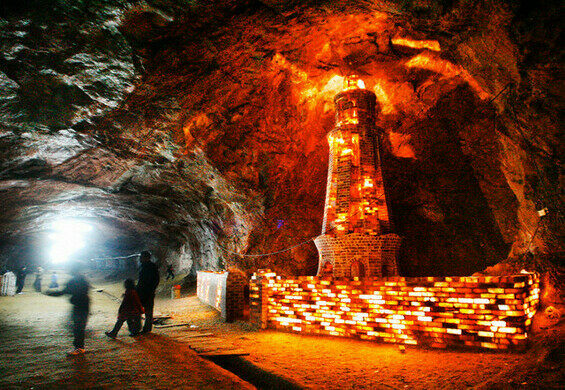 Among the earliest structure built within the mine is the small Badshahi Mosque, complete with a small salt minaret. 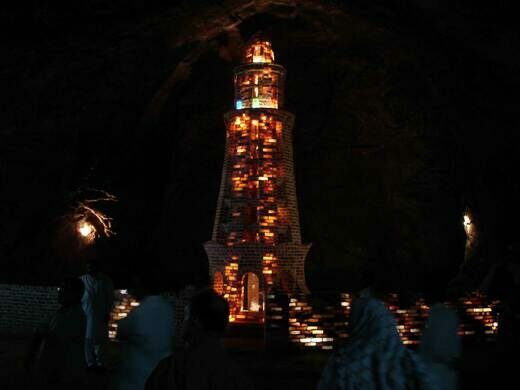 Built more recently, specifically to attract tourists, are small salt versions of the Great Wall of China, the Mall road of Murree, Lahore’s Shimla hill, and the Minar-e-Pakistan in Lahore. 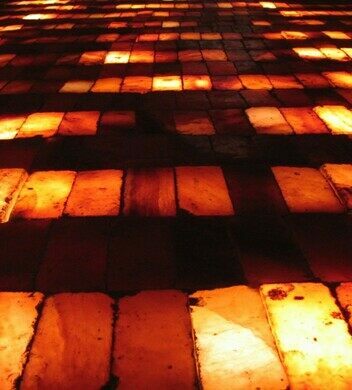 Both the mosque and the miniatures are built from salt bricks, which vary in color from red to pink to white, and which are now lighted electrically and radiate a beautiful warm glow. At times, the many colors and bricks of light give the mine a sort of disco-Yellow-Brick-Road look. Other sights — and there are many — include a 75-meter-tall “assembly hall” chamber with stairs spiraling up the walls, a 25-foot-long Salt Bridge called the Pul-saraat (an allusion to the Islamic “Pul-e-Saraat,” a bridge you must cross on Judgment Day which is described as “thinner than a strand of hair and sharper than a sword”), brine ponds, and beautiful salt-crystal formations such as stalactites. 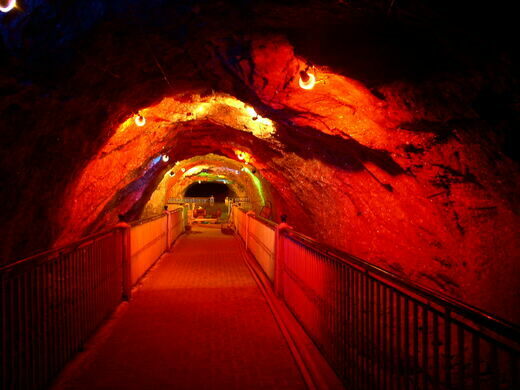 Much of this can be seen from the narrow gauge electric railway, in place since the 1930s, which once extracted salt from the mines and now brings tourists into them. 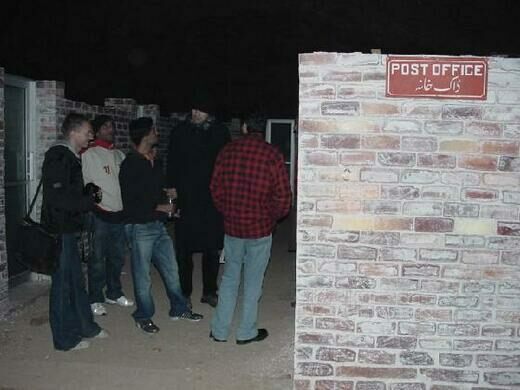 The Khewra salt mine even has its own fully functioning postal office, for use by the workers. 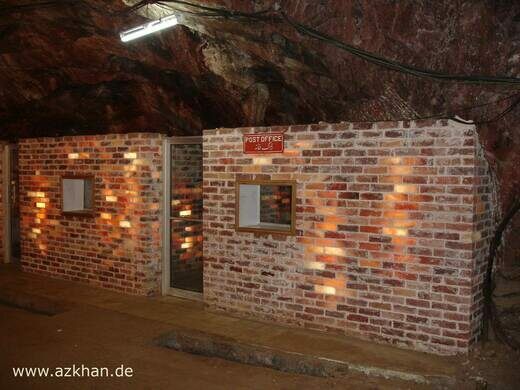 The post office is built entirely from salt bricks and is the only post office built out of salt in the world. 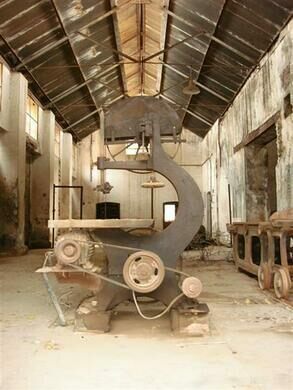 While a popular tourist destination today, the salt mines were the scene of brutal oppression and forced work by the British in the 1800s. Miners were locked into the mines and not allowed to leave until they fulfilled their quotas. 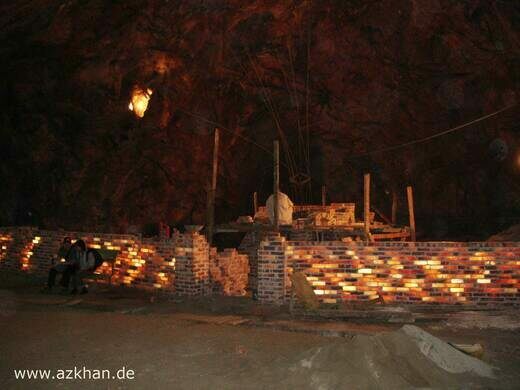 This included pregnant women and children, and a number of children were born within the mine. Strikes were met with violence from the British, and in 1876, twelve minors were shot and killed at the entrance to the mines. 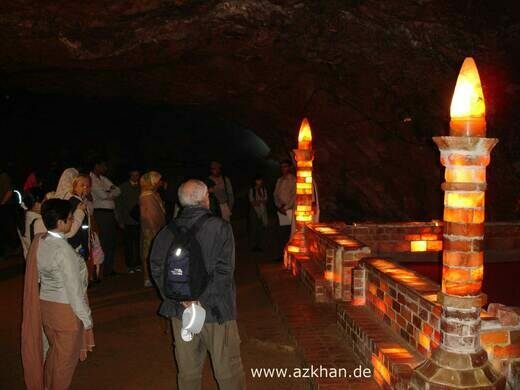 Their graves can be seen at the middle gates of the mines. 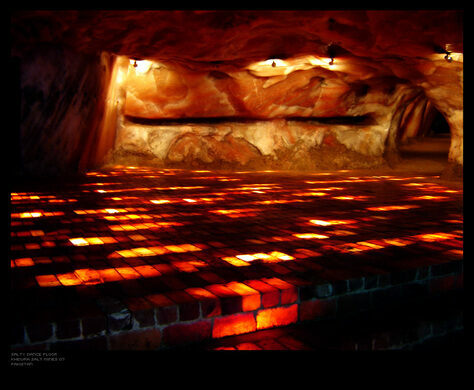 One can taste the output of this salt mine by going to their local grocery and looking for “Himalayan Salt,” a reddish or pink rock salt. It is significantly more delicious then your average table salt, and comes with a much more interesting back story. 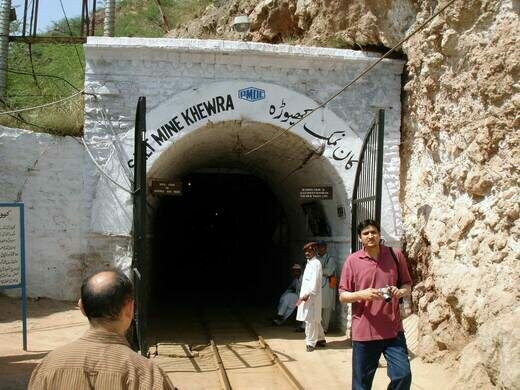 Motorway M2:The fastest way to reach Khewra mines is via motorway M2. The mines are located 30km east of Lilla interchange towards Pind Dadan Khan. Road signs are quite visible. Highway N5: A slower but scenic approach is also available from GT road?from Mandra. ?Distances?from Mandra (0km)are:?Chakwal (63km), Choa Saidan Shah (93km) and Khewra (103km). 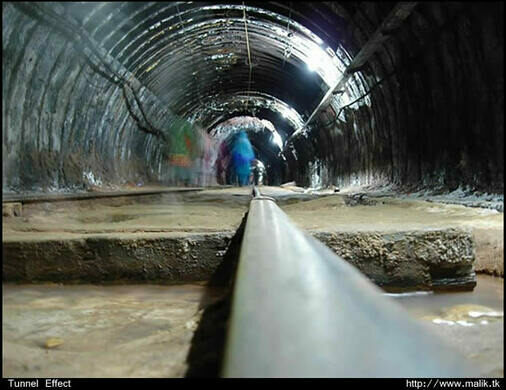 There are two trains daily between Malakwal Jn and Khewra which cover 27km distance in exact 1 hour. You have to change trains at Malakwal Jn which is connected to Lala Musa Jn on mainline at one end and Sargodha Jn at other. 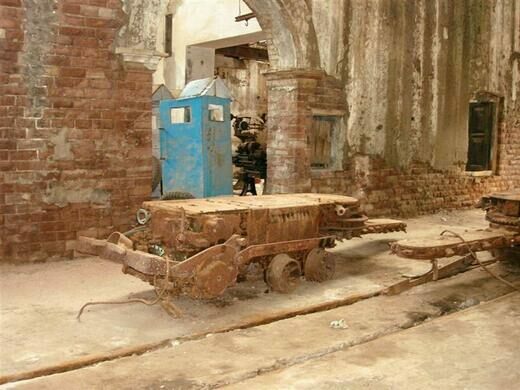 There are 6 daily trains on this Lala Musa - Malakwal - Sargodha route. Hideout of thieves, monks, and goat-footed gods.